At the northwestern end of Ostrov Matua (Matua Island), Sarychev Peak ranks among the most active volcanoes in the Kuril (or Kurile) Islands, which stretch between Hokkaido, Japan, and Russia’s Kamchatka Peninsula. 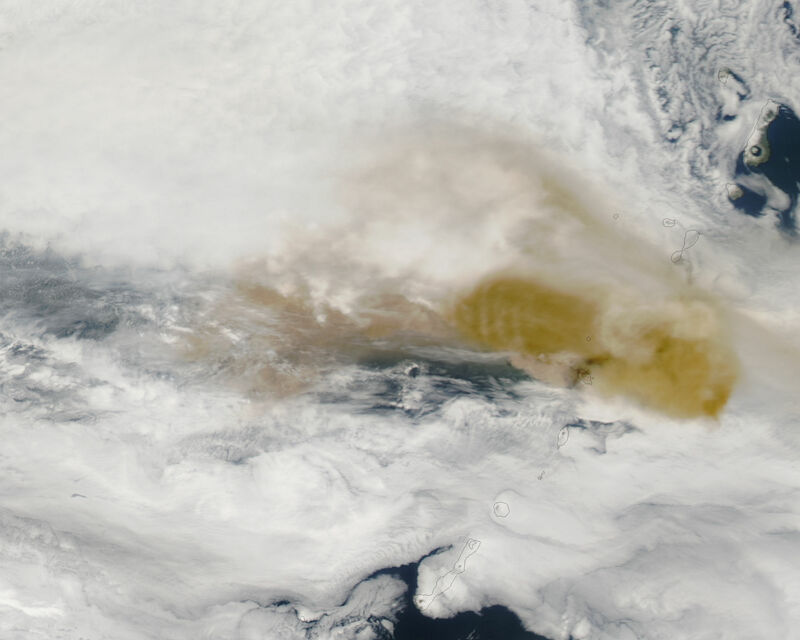 On June 12, 2009, Sarychev Peak began a series of eruptions that spread ash far and wide across the northwestern Pacific. This series of images shows early and mid-afternoon views of the volcano on June 14 and 15. The images were captured by the Moderate Resolution Imaging Spectroradiometer (MODIS) sensors on NASA’s Terra and Aqua satellites. The brown ash plumes stand out sharply compared to clouds. 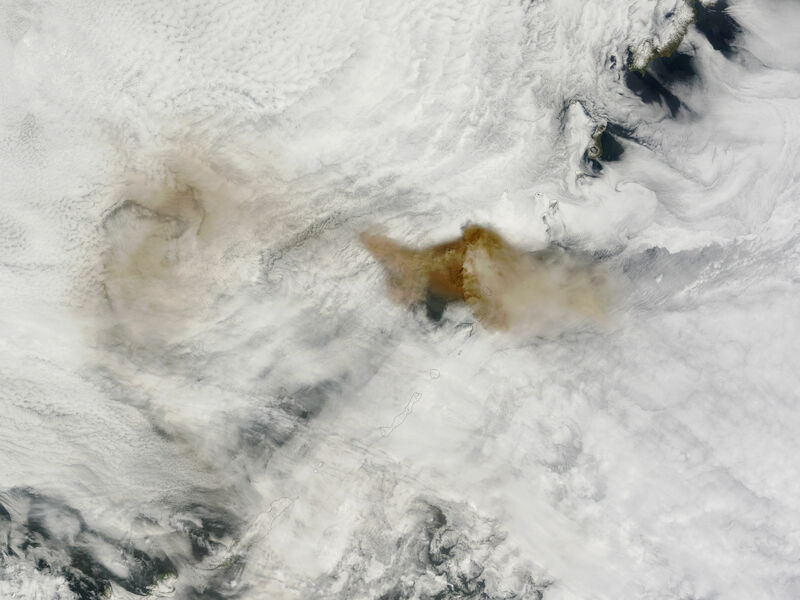 Each time one of the satellites passed overhead, the location of the plume had shifted dramatically. Between the two overpasses on June 14, the ash spread north and west from the volcano. 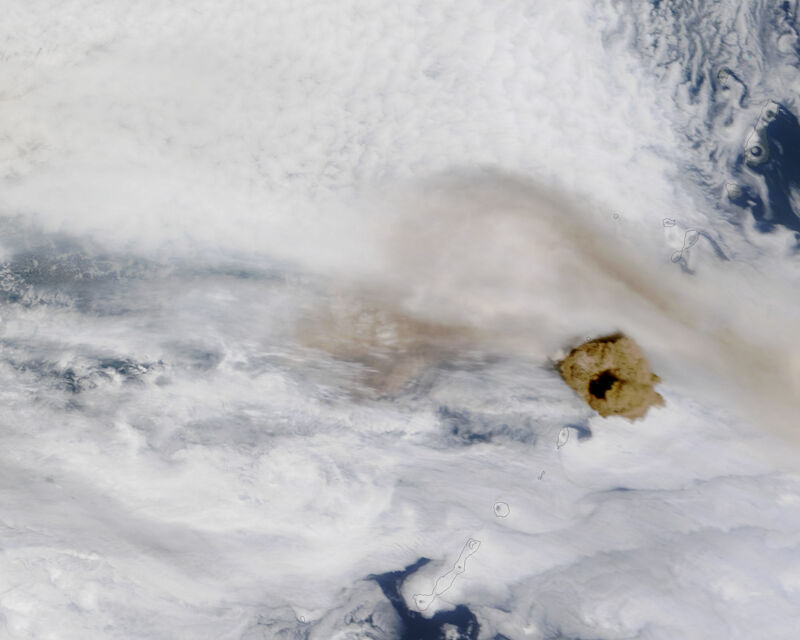 On June 15, a compact plume of ash towered over the volcano during Terra’s view of the area. By the time Aqua observed the volcano, the ash had spread out to the east and west. On June 15, the U.S. Air Force Weather Agency (AFWA) reported that the ash from Sarychev Peak had been detected up to 1,300 nautical miles (about 2,407 kilometers) east-southeast of the volcano and 500 nautical miles (926 kilometers) west-northwest. Volcanic ash is not like the soft, fluffy ash produced by burning vegetation. It is tiny, abrasive particles of glass and rock that pose serious hazards to aircraft engines. 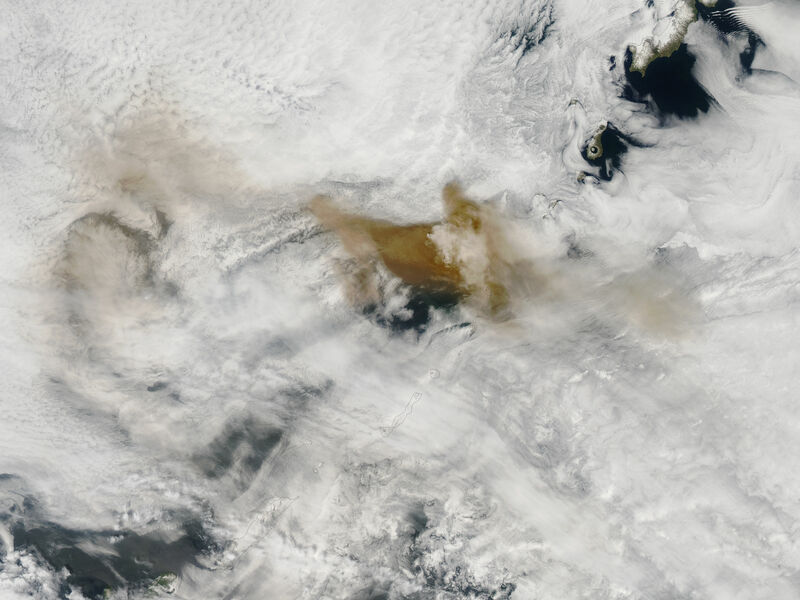 Satellite observations of ash play a crucial role in helping meteorologists and air traffic controllers steer airplanes clear of dangerous volcanic emissions. NASA images by Jeff Schmaltz, MODIS Rapid Response Team. Caption by Rebecca Lindsey and Michon Scott. This series of images shows morning and afternoon views of the ash clouds from Sarychev Volcano on June 14 and 15, 2009.